Chappie is an easy target for critical bashing. It is overblown and edited at a fever pitch lest the audience be able to catch up and think about what is occuring on screen. This may be for the better, as the film cribs liberally from Robocop, Short Circuit, Oliver Twist and director Neill Blomkamp's own District 9 and by all accounts improves on none of the above. Chief among the films sins is the absence of likable characters. In a film filled with engineers, CEOs and artificial intellegence, it's amazing how stupid absolutely everyone is. Engineer/Computer Programming wiz kid Deon (Dev Patel) tests a new artificial intelligence program on a damaged police robot. This robot is subsequently kidnapped by bumbling, post-modern gangsters Ninja and Yo-Landi (playing themselves) who dub him, "Chappie." Since Chappie's programming requires him to "learn" just as a child would, Ninja and Yo-Landi raise Chappie as their own, committing various acts of child abuse along the way. Subplots involve a heist that Ninja and Yo-Landi must commit to pay off an angry kingpin, and Deon's rival (Hugh Jackman) wants to decommission Chappie's line of robots so that his line will go to manufacture. Deon role exists largely to explain the plot. Much of his screentime is spent driving from one location to another, and his energy drink addled persona rarely stops for a moment of contemplation. Chappie is the star of the show and his CGI and motion capture by Sharlto Copley is excellent. Though Hugh Jackman has some scenery chewing fun as the villainous Vincent, his Catholicism is shoehorned onto the film, as is the film's unwarranted, unearned discussion about if robots have souls. Signorney Weaver is absolutely wasted in what is essentially a walk on role as the CEO of the robotics and weapons company that manufactures Chappie's line. By far the dumbest characters in the film are Ninja and Yo-Landi of the rap group Die Antwoord. Die Antwoord stand for The Answer. God knows what the question is. They combine various forms of crunk and seapunk to give what is undoubtedly a divisive performance. As annoying as they/their characters may be in the film, at least their self-aware gangster shtick is interesting and something brings something fresh to the film. It is unfortunate that their plotline would be suited for bumbling crooks in a children's film. Think a foul-mouthed Harry and Marv from Home Alone. Director Blomkamp does a fine job with action sequences, but along with his co-writer Terri Tatchell and his editors, he fails to create a cohesive vision for the film. Tones, plot points and characterizations meted out with impunity. The film combines a half dozen major influences, and switches from sentimental to black comedy at the drop of a dime. Perhaps worst of all is the relentless pace of the film. Audiences do not watch Chappie; it assaults them with action and unearned feeling. 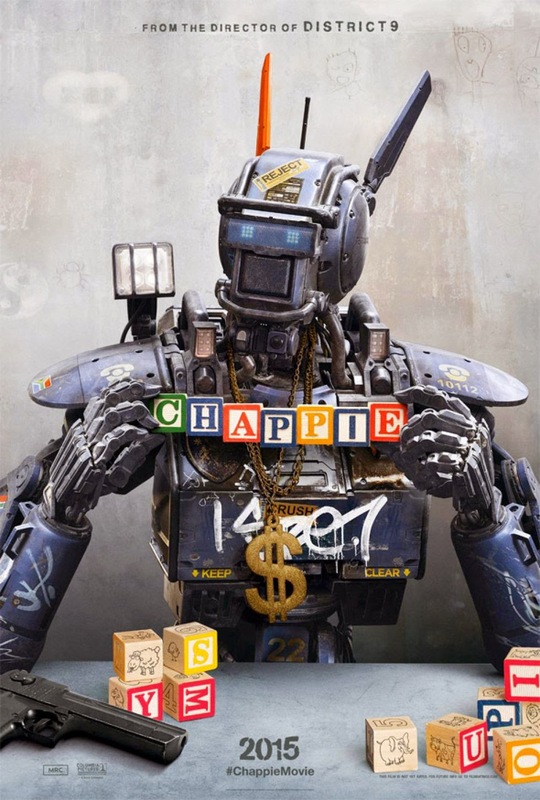 Though there may be likable elements around the edges of Chappie, it is by all objective standards, a mess.